At the moment of writing this article, the SSMA for Oracle solution is in version 7.7 and we can migrate an Oracle Database 9i (or higher) to an on-premises SQL Server 2008+ or in the Azure cloud. In this article, we will review the installation of the tool in order to prepare a migration. An extension pack that will allow you to migrate data from your Oracle instance. [sysdb] – contains not only the database objects (tables, procedures) needed to migrate data but also functions that emulate the Oracle system functions. [ssmatesterdb] – contains database objects used by a validation component (called “Tester component”). As you will see in following, this client actually uses CLR capabilities of SQL Server. Go to Microsoft’s download page and download the tool (client and extension pack). An Oracle Database Client must be installed, at least in the same version as a source or higher. Let’s consider the client computer does not have an Oracle client and first install it in its latest available version (12.2.0.1). Here is the content of the folder for that version. Run “setup.exe”. If so, click on “Run”. Now, you will get in touch with the “OUI”, Oracle Universal Installer. Here is the first view we’ll get. Select “Instant Client” installation type. Specify the location where you will install the Oracle Client software. It’s referred to as the Oracle Home. You get a summary of what it will do. Click on “Install” to start the installation. Once the installation is done, you will get a pane with a “Done” button on which you can click to close the Oracle Universal Installer (OUI). Go to the folder in which you downloaded the SSMA tool installers and open the msi file corresponding to your environment (x86 or 64 bits). You could eventually get following warning message. Click on “Run”. And the installer is ready for us to play with it. Accept the agreement and click on “Next” button. Choose the setup type you want. I personally prefer getting the whole program. Here is what I think as unfortunate: you can’t disable telemetry and error reporting… Click on “Install”. Let’s still install Oracle client in its latest available version (12.2.0.1). Select “Custom” installation type and click on “Next” button. Some of the components of the Oracle Client can run as a Windows Service. You are asked to provide the name and password for this account or choose a Windows Built-in account, which is the option we will take. Now, it’s time to specify the location of the installation, the famous ORACLE_HOME. Here is a suggested configuration. Once you are ready, click on “Next” button. You arrive to the components selection list. 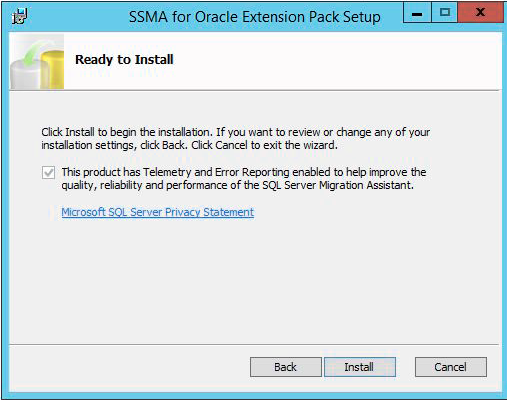 Make sure to select the OLEDB provider as it’s mandatory for SSMA Extension Pack. You can also add other components like SQL*Plus and Oracle Net (the network layer of Oracle Database product) for convenience. As soon as you selected all the features you want, click on “Next” to go to the summary view. Before hitting the “Install” button, just take the time to close the SQL Server instance located on the destination host. It won’t break the installation if it’s still up and running but to be able to use the OLEDB provider, the destination instance will have to be restarted. Once it’s done, click on the “Install” button and wait for the installer to complete its job. Once the installation is done, you will get a pane with a “Close” button on which you can click to close the Oracle Universal Installer (OUI). We can restart SQL Server services, open SQL Server Management Studio (SSMS) and connect to the destination host. You will find below the process for installing the Extension Pack on a Windows Server 2012R2. But, before that, let’s review its prerequisites. SQL Server Browser Service must be running during installation. A temporary rule in your local firewall that allows traffic to UDP port 1434 could be necessary if a problem occurs while SQL Server Browser Service is running. First, open Services and start “SQL Server Service Browser” service. Then, go to the folder where the Extension Pack installer is located and run this installer. The following dialog will open. If so, go back to prerequisites sub-section and make sure to do the appropriate action to meet them. You will then be proposed to accept or reject license agreement. If you accept, check the option and click on “Next” button. Like the client application, you will be asked to choose the installation type. We will choose the “Complete” to be sure we can take the most out of this tool. So, let’s click on the “Next button”. A new dialog will pop up to provide information on the destination platform. Here, as we are on Windows, we can just click on “Next” button. It will display a selection list with SQL Server instances available on the current computer. Select the appropriate one and click on “Next” button. You are asked to provide credentials (if Windows Authentication is not used). Next step consists in providing a password that will be used as database master key for the databases the installer will create. Once it’s done, click on “Next”. For next step, just hit next, it will tell the installer to create two databases: sysdb and ssmatesterdb. As you can see the second database is optional, but it’s worth spending additional time testing than being confronted to a problem after the migration. Hit “Next” button and the installation process will start. Once the process ends, it will ask you whether to run against another instance or not (on the same server or on Linux). If you installed the Extension Pack on all the instances you had to, just click on “No” then “Exit” buttons. Last but not least, open a new connection on SSMS and run following T-SQL code that will enable CLR. The SSMA Extension Pack is now installed. Let’s now check what has changed on the destination server. First, the two databases sysdb and ssmatesterdb have been created. Procedures and functions defined in ssma_oracle schema. We now have everything for the tool to run, except that we should create a user/login on both source and destination that meets prerequisites. It’s what we will do in following part. The Oracle TNS is the network layer of the Oracle Client. We can create kind of a directory file in which we will map a network name to a network descriptor. Edit the file and add following descriptor, replacing values in red by the one corresponding to yours. NB: some of you may be using SID instead of SERVICE_NAME. The easy way to do it is to use the SYSTEM account on the source server, but it’s not the most secure way… Let’s create an account with those permissions. CREATE USER SSMAUsr IDENTIFIED BY "123456a." SSMA prerequisites are pretty clear about what has to be done here: you must define a sysadmin account that will be used for actual migration. To be able to run a migration test, we will first need to create a new project. It’s done by either clicking on the new project icon or clicking on “File” menu then “New Project”. As soon as you clicked the “Ok” button, some actions become active and we’ll first connect to the source server by hitting the “Connect to Oracle button”. A dialog will show up and you’ll need to enter details about the connection. In this article, we’ve seen how to install SQL Server Migration Assistant for Oracle. We also ran it to check that it can connect to an Oracle database based on the steps we followed. In the next article, in this series, we will discuss how to use SSMA by migrating an example schema from an open source application designed to connect to both SQL Server and Oracle. Stay tuned!